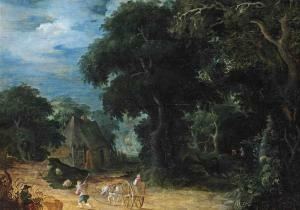 Find artworks, auction results, sale prices and pictures of Abraham Govaerts at auctions worldwide. 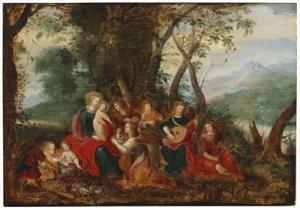 Abraham Govaerts and Louis de Caulery (Antwerp 1589–1626) and(circa 1580–1622 Antwerp) The Virgin and Child with angels in a wooded river landscape, oil on panel, 46.1 x 65.5 cm, unframed Provenance: Private Collection, Belgium A certificate issued by Klaus Ertz (15th July 2016) is available. Ertz on the present painting: \“Govaerts developed a personal style that can be recognized in all of his paintings. The entire scene of the panel to be assessed seems extremely vibrant; the trees seem to bend and rise in a serpentine fashion, with dead tree stumps and gnarled branches on the left and right. 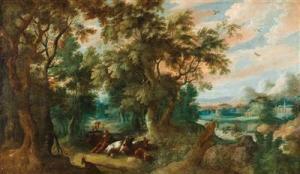 All in all, this is a highly dynamic approach to nature that is close to that of Peter Paul Rubens. 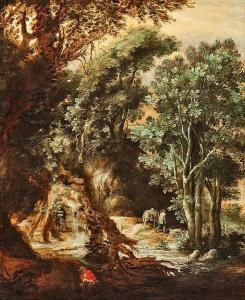 This vigorous style, with its numerous short curves, is a special idiosyncrasy that can particularly be observed in the art of Abraham Govaerts and also recurs in the paintings of such landscapists as Kerstiaen de Keuninck, Alexander Keirincx, and, more rudimentarily, Jasper van der Lanen. Caulery\’\’\’\’\’\’\’\’s staffage matches Govaerts\’\’\’\’\’\’\’\’s style: the figures are inclined to one another while interacting and are surrounded by billowing drapery […].\” Ertz dates the present painting to the second decade of the 17th century. Circle of Abraham Govaerts. 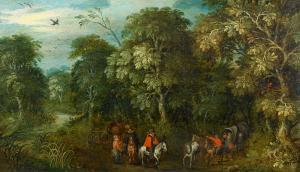 Forest landscape with a muleteer and a fisherman. Oil on panel. Unsigned. Verso an old label of Kunstsalon Abels, Cologne, an old shipping label of Schenker & Co. GmbH Cologne - Bonn, thereon numbered «No. 3661», dated «19./9.56», as well as inscribed «Botschafter Blankenhorn, Paris», and a further printed label with the work's and the artist's life data. Restored.